A visit to Brooklyn's Coney Island during the off-season makes for a bracing experience. It's eerie and dramatic: the open sky, the ocean, and the backdrop of the famous Cyclone roller coaster and Parachute Jump. 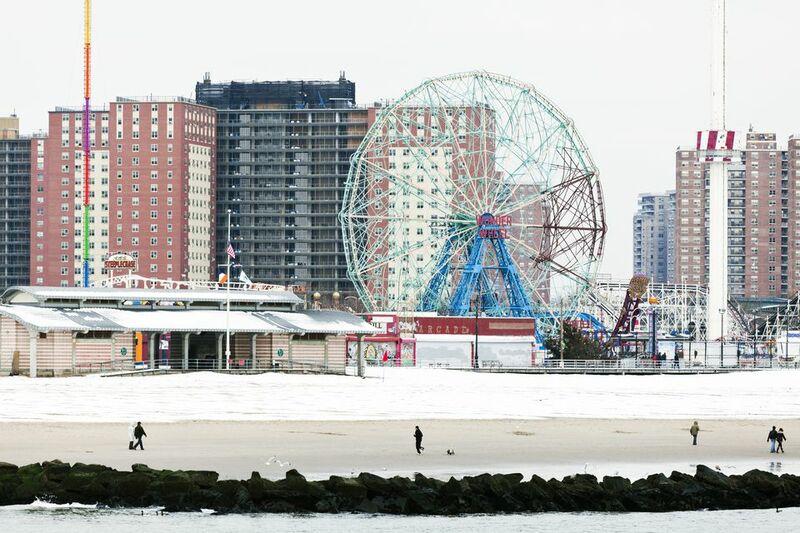 Coney Island in the wintertime is beautiful in an isolated, industrial-urban-landscape kind of way. It's the perfect escape from the hustle and bustle of New York City. Coney Island's amusement park and beach are closed September through May, but there's plenty to do, and eat, and dream about as you wander the area off-season. Come prepared for brisk ocean breezes. New York City's world-class aquarium has amazing exhibits and fish-feeding shows. Open year-round, with both indoor and outdoor exhibits, the Aquarium makes for a nice date or good family fun. If the weather turns unpleasant, the indoor of the aquarium is a great place to take refuge with an indoor reef filled with sharks, rays, and sea turtles, plus a 4-D interactive movie experience. For a bite to eat, the Oceanside Grill offers a sustainable seafood menu with dishes like fish tacos and fish and chips. Best of all, the eatery only has no environmentally-friendly packaging— so no plastic straws, cups, or bags. New York’s most famous boardwalk offers views of Coney Island’s rides and amusement park on one side and the rolling Atlantic Ocean on the other. For tourists and first-time visitors, a good itinerary is to start at by the amusement park and then walk all the way to Brighton Beach. In Brighton Beach, you can find a good, hot bowl of authentic Russian borscht before heading back home on the subway. The staff at local favorites like Varenichnaya between Brightwater Ct & Brighton Beach Avenue, Skovorodka at Brighton 7th St & Brighton 6th Street, and Chaykhana between Bay Parkway and Bay 29th Street are always ready to provide a hearty meal for travelers they spy coming in from the cold. Founded in 1916, Nathan's is hardly a mom-and-pop stand anymore. As there are now about 8,000 Nathan’s Famous hot dog stands in the world, it's become a global franchise. But this indoor stand at Coney Island is the original. Some people swear the dogs here taste better than anywhere else and scarfing down a foot-long near the pungent sea air is a quintessential Brooklyn experience. Nathan's also offers hamburgers and chicken sandwiches if you prefer a hot dog alternative. As a side dish, the crinkle-cut fries with cheese, bacon, or both are well worth the cholesterol increase, or a grab a serving of piping hot onion rings. For something to drink, the freshly made lemonade is the perfect sweet and tart refreshment to go along with the meal. Even in as serious a pizza-eating place as Brooklyn, Totonno's pizza stands out among the hundreds of local pizzerias in the borough. The thin crust, fresh sauce, and everything else on the menu are made each day on the premises. Locals swear by the pizzas that are baked in a brick oven and you'll find the restaurant buzzing from the time it opens. Totonno's has justifiably earned a slew of Zagat raves since it opened in 1921, but as for decor, it's as minimal as the pizza crust is thin. This idiosyncratic little museum is dedicated to preserving Coney Island’s unique history. What you'll find upon walking in is a monument to the unsanitized, zany, freak show side of Coney's past. The museum has old photos, antiques, memorabilia, and relics of Coney Island's past. In addition, you might catch a special exhibit like a collection of vintage funhouse mirrors, lectures, and live performances. Entrance costs $5.00 for adults and $3.00 for seniors and children under the age of 12. If watching isn't freaky enough for you—why not join in? For a $1500 tuition fee, Professor Adam Realmanteach and the staff at Coney Island USA's Sideshow School will reveal the tricks the trade. Graduates walk away knowing how to eat fire, swallow swords, walk on glass, charm snakes, sleep on a bed of nails and more. Only students 18 and older are permitted to matriculate. Starting a new year with an icy dip is a great Brooklyn tradition. Founded in 1903, the Coney Island Polar Bear Club claims to be the nation ’s oldest winter bathing organization. Hundreds of New York Polar Bears gather in Coney Island every New Year's Day for a 1 p.m. dip in the Atlantic Ocean, whatever the weather. The water may be frigid, but it's a party once you dive in. As a bonus: There’s no fee for swimmers or observers. While the Club meets every Sunday from November to April for a swim in the Atlantic Ocean, the January 1st dip attracts the biggest crowd of the year. To participate, bring along swim attire (and a change of clothing) and show up at the beach near Stillwell Avenue between 10 a.m. and noon to register for the event and sign the waiver.